Here’s a look at our beer list for our upcoming Chicks For Beer with Faction Brewing! Traditional Pilsner brewed with Saaz hops and Castle pilsner malts. 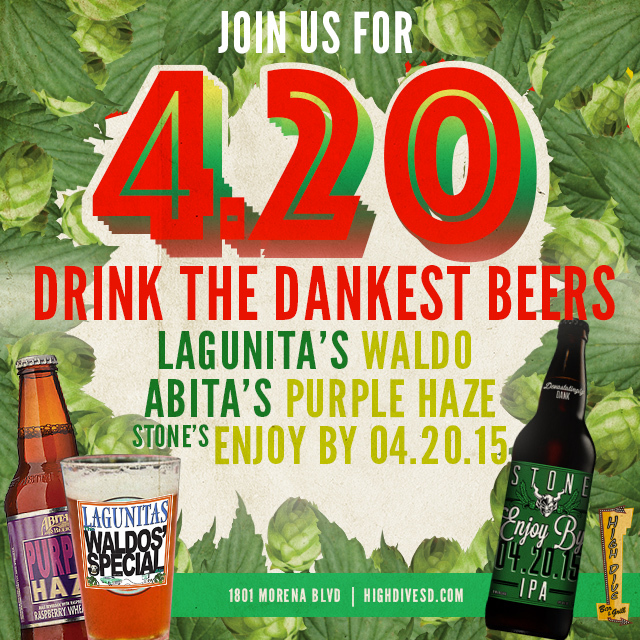 Brewed with “Hop Hash” and Crosby hop farm Cosmic Blend hops. Here’s a look at our beer list for our upcoming Chicks For Beer with Russian River Brewing Co.! STS Pils – 5.35% ABV, German-style pilsner, just won Gold at GABF! Framboise For A Cure – 7% ABV A sour blonde aged in Chardonnay barrels, with 2 pounds of fresh organic California grown raspberries per gallon of beer! This is a very rare and special beer that always gives to local Breast Cancer organizations. In 1996 brothers Ron and Rick Chapman realized a long-time dream and got ahead of the craft brew curve in a big way, opening a brewpub in the heart of their hometown of Coronado on Aug. 30th. Pioneers of craft brewing, they found themselves in an industry of 1 of 5 in San Diego at that time. They worked with an original brewing system of 10-bbl brewhouse, (3) 10-bbl fermenters and (3) 10-bbl serving tanks. Now, years later, the brewery’s a lot bigger and they’ve gotten a number of awards. But they’re still following that same dream: brewing exceptionally balanced beer to an ever-growing family that seeks an undeniable coastal vibe, and shares our passion for great beer. Tickets to October’s CHICKS FOR BEER are still available. Ladies, come join the High Dive and Anderson Valley Brewing company for our monthly charity event at 7pm, TUESDAY, JULY 21. Taste 5 delicious brews paired with a 5 course meal! More details on our EVENTS page. Tickets available in house and ONLINE. ATTN: BEER-LOVING LADIES: July’s Chicks for Beer features the Anderson Valley Brewing Company. Tuesday, July 21st at 7pm, join us for a 5 course meal paired with 5 delicious Anderson Valley brews while learning about the beers!! Purchase tickets for $45 at the High Dive or ONLINE. All proceeds go to Susan G. Komen’s San Diego chapter to help support the fight against breast cancer. Join us for 4/20 and drink the dankest beers! 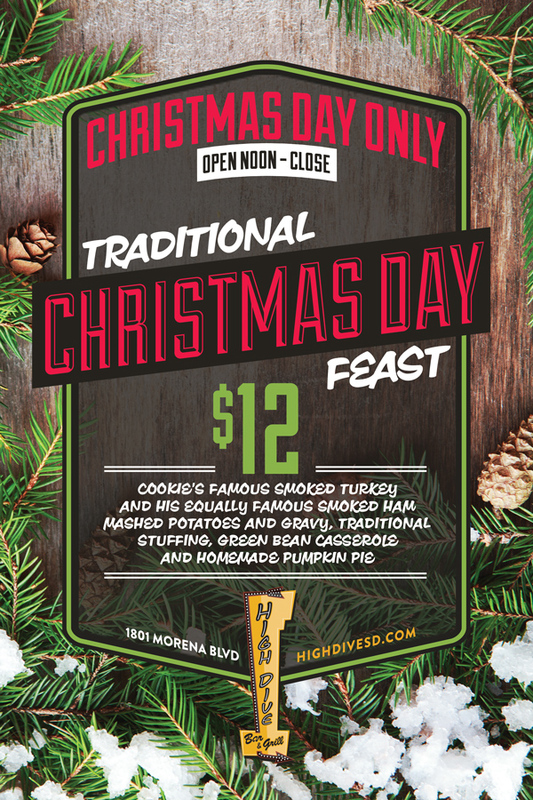 Merry Christmas from your friends at the High Dive! 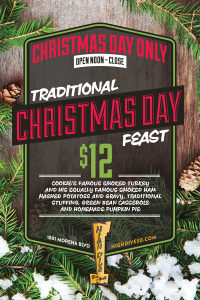 We will be open at 12pm serving our famous home cooked traditional Christmas meal. Smoked turkey, smoked ham, mashed potatoes and gravy, stuffing, green bean casserole, and pumpkin pie for dessert! So put on your ugly Christmas sweater and celebrate with us! Oktoberfest is in full swing at the High Dive! Purchase your 34oz stein at the bar and receive $10 refills all October long! The High Dive Women’s OTL team took home 3rd place in the 61st Annual World Championship OTL OMBAC tournament! These girls went on a 9 game winning streak to finish in the 3 overall spot in the tournament! We are so happy to have been part of Stephanie, Tamara, & Alissa’s amazing run in the OMBAC OTL bracket! CHEERS LADIES!!!!!!!! 61st Annual World Championship OTL OMBAC tournament!!!! To show our support, The High Dive is sponsoring a team this year!!! My name is Stephanie Watson and I currently live in Yuma, AZ but I grew up in San Diego and will be a resident again in the next couple of months. Once I move back, I will be taking applications for my search for my third husband, baahaha just kidding!I currently work for Hunter Insurance Services, Inc. located in El Cajon, CA. I sell both commercial and personal insurance and have for about 11 years. I have played Over the Line for 20 years, my first OMBAC was in 1994. I grew up playing softball and golf so OTL came naturally. My best finishes have been 2nd place in both the Open and Century Divisions with a dozen or so top 8 finishes. My name is Tamara Larsen Piland and I am a California native. I have loved living in San Diego since 1992. I work as an Accounting Manager and I am married with a son who is 5 years old. I was introduced to OTL as a spectator, and had such a great time that I decided I should learn how to play. I have been playing for about 15 years now and have played in both the Open and Century Divisions and my best placing is 3rd two separate years in Century. This year we are playing in the Open division representing The High Dive! 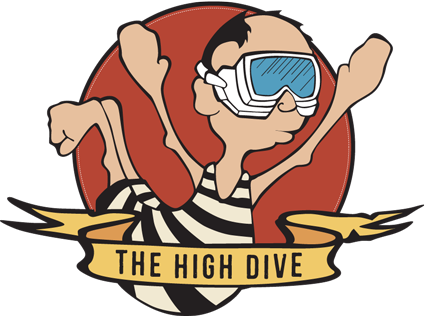 I love to go into the High Dive for a few drinks and food with friends. I also love watching Chargers games there. My name is Alissa Weiss and I have been a teacher of Physical Education for 26 years working for San Diego Unified School District. This summer I will be married 25 years to my awesome husband Alan. We have two amazing boys in college. Our oldest, Neil is 22 and a senior at UNLV. Bobby is 19 and finishing his freshman year at UCSB. I have been playing OTL for 30 years and I am an avid tennis player. I also love to travel and eat with my family. The High Dive is proud to be serving the new Ballast Point infused vodka series. In San Diego, we have some of the freshest, most authentic Mexican cuisine north of the border. So to flavor our Fugu vodka, we took our inspiration from the tastes served up at our neighborhood taco shops: spicy habanero peppers, creamy horchata, and aguas frescas with sweet Jamaica hibiscus or juicy pineapple. The result: a world-class vodka, infused with local flavor.